Liverpool star Fabinho has made it clear he’s confident he can improve as a centre-back if he continues to play there more often. 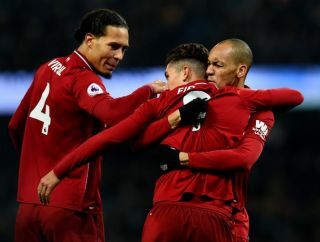 Jurgen Klopp was forced into something of a risky move by trying the Brazil international in defence in the recent Premier League win over Brighton. However, it paid off well as Fabinho put in a strong performance alongside Virgil van Dijk, showing Klopp he can help the team while Joe Gomez and Dejan Lovren are out injured. The Reds have been solid at the back all season, helping them to a four-point lead at the top of the table, but the partnership of Van Dijk and Gomez has looked by far their strongest. The England international will hopefully return to action for LFC soon, but until then Fabinho seems to have made it clear to his manager that he’s ready to step in and thinks he can end up being a good option for the club in this new role. ‘When Dejan got injured, I knew it would be logical that I’d play in that position,’ Fabinho told Liverpool’s official site. ‘I had some training sessions playing in that position, which helped me adapt better and pick up certain aspects, like positioning and movements you need to be natural at to play in this position.